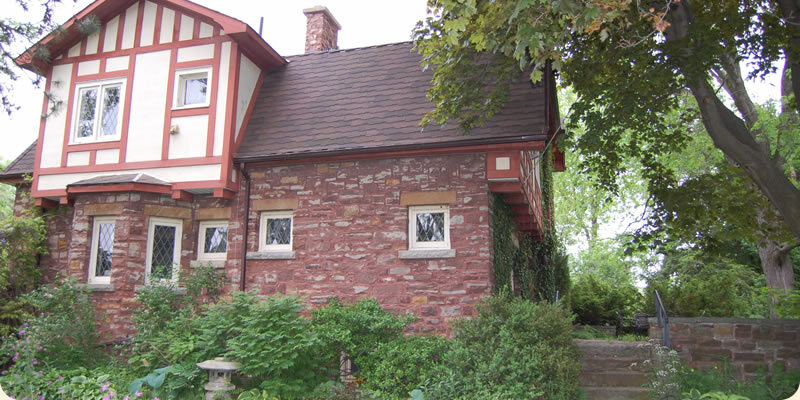 You’ll enjoy true seclusion in a wonderfully natural area of the Niagara Peninsula yet be minutes away from all the attractions Niagara has to offer. We have three bedrooms and can sleep up to 9 people in all the rooms. Room pricing per night is between $125 – $154.00, no tax. Click here for more details about our rooms. Our full local, organic breakfasts can accommodate vegetarians, vegans and gluten-free diets. Choices of eggs & (smoked ham, bacon or breakfast sausages) OR Waffles and local maple syrup and choice of same meats OR choices of hot or cold Cereals, muffins, English Muffins, cheese, crumpets (if available in our little Vineland grocery store) and from my garden in season, toasted tomato sandwiches, herbs and beans, etc. etc. Fresh seasonal fruit, jam, honey and free range eggs from local farm families. Organic free-range meat purchased from local farms. Peanut Butter freshly ground at Vineland’s health food store, Sangsters. No matter what else you order, we always serve local seasonal fruit and home-made jams and jellies, yogurt and local honey. (Mom and I used to keep bees!) We are located in the Tender Fruit Belt of Canada aka The Banana Belt, so in season have local peaches, plums, apricots, cherries and in the autumn local apples and pears. We have our own organic pears and apples, which we pick that morning for your breakfast. And doggy Willow and I always pick fresh red currants, blackberries and raspberries from our garden for you. We collect my favourite, the black raspberries in Niagara woodlands. Please pay full amount by cash or cheque upon arrival, no exceptions. Cancellation: 2 weeks notice, but flexible if you arrange ahead of time. If room can be booked no charge, otherwise if the guest cancels less than 7 days in advance, the nights not spent are not refunded. If the guest arrives and decides to leave early, the nights not spent are not refunded. IF CANCELLING RE THE POLICY RULES, CHARGES WILL BE TAKEN FROM THE CREDIT CARD PROVIDED TO HOLD THE BOOKING. Here are a few kind words from guests. “My girlfriend and I stayed at Bonnybank B&B in late September and had a truly wonderful time. We were looking to get out of Toronto for a few days, enjoy a few Niagara vineyards and enjoy some of the natural beauty of the escarpment. The location of the B&B relative to the highway made it a convenient spot to use as a jump off point for daily excursions, but was also secluded enough to give that truly ‘country-style’ feel. The owl sanctuary next door made for some beautiful music at night and a great spot to visit. We were lucky enough to be there during the ‘patrons weekend’ at which time they give a full tour of the property. Carla, our hostess and the owner/operator of the B&B, was remarkable. She was exceptionally sweet, attentive and knowledgable about the area – particularly its geological history and ecology. As two ‘green enthusiasts’ we felt right at home. Her meals were simple, but fantastic as well. “When my wife, our infant son, and I spent two days in the Niagara area, we had the good fortune of staying at the Bonnybank B&B where our hostess Carla made the visit a delight. The room, the house and the area had a nice homely feel to it. But it was especially Carla’s who made it something special. It’s seems that there is nothing she wont do for you. Breakfast included a wide variety of foods and was served with a view over the beautiful winter garden where birds an squirrels came to feed.